The Fiber Nation: McCall's Quilting Magazine and a Meadowlark Giveaway! 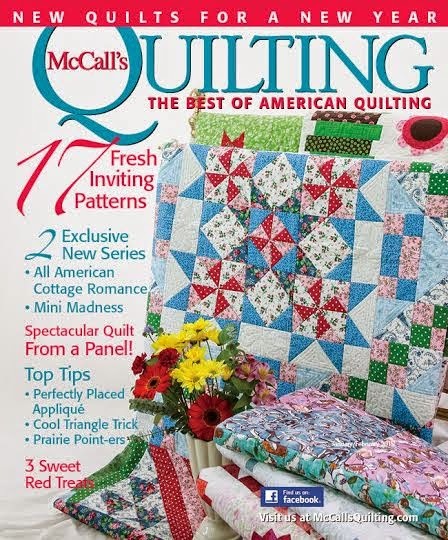 McCall's Quilting Magazine and a Meadowlark Giveaway! Ladies and gentleman, I am in McCall's Quilting Magazine! I still can't quite believe it! This is the closest I've gotten to being a "Covergirl" so far! As many of you know, I was working on some quilts that I wasn't able to share (this was for Market this past spring!) Well, I was designing and making quilts using Melanie Testa's fabric from her Meadowlark line put out by Windham Fabrics. I've been sitting on this news since this past spring - and now I can finally share it with you! This was an exciting process, as I was able to see Melly creating the line, and then her excitement when Windham picked it up. It's a special feeling to be one of the first people to ever cut into, and create with a designer's first fabrics! The Meadowlark line is Melly's way of raising awareness about the plight of the 20 Common Birds in Decline listed by the Audobon Society. She has a post about it on her blog! I wanted to really be able to showcase Melly's fabrics, so I approached the design process asking myself "How can I show these fabrics as they are, and still cut them up and piece them?" The answer was "THINK BIG!" and I did. At 60.5"x60.5", the blocks in this quilt are 15" blocks! I might be biased (that's not a pun, I swear! ), but I am in love with this quilt! I have an AWESOME prize opportunity for a lucky reader! Melly has graciously arranged for me to be able to give away a fat quarter of every fabric from her line Meadowlark! That's 26 fat quarters my friends! To be eligible all you need to do is leave a comment telling me what your favorite common bird in your backyard is! Deadline for leaving a comment is Sunday, December 7th at 11:59pm. Winner will be announced Monday the 8th! I love this quilt. I had McCalls Quilting Magazine opened to this page last night dreaming what fabrics to use to make it my own. I love and prefer fat quarters so I hope I win the package. Thanks for a fabulous pattern. This is such a lush quilt! The perfect vehicle for Melly's delightful fabrics! Love the pattern and especially the fabric! Would love to win a fat quarter !! My very fav bird is the mockingbird who "owns" my backyard ! My bird of choice would be humming birds, I fill six feeders for them. 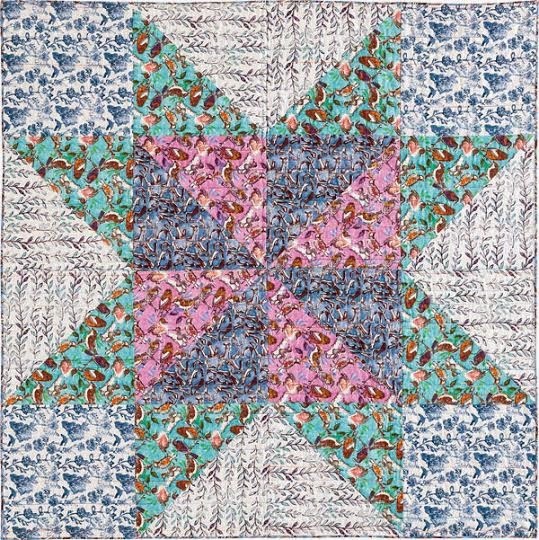 Love the beautiful fabric used in your quilt. The quilt itself is simply stunning. Thanks for the giveaway. We get parakeets sometimes in our backyard in Brooklyn! Definitely my favorite to spot! Melly's designs are so amazing and the quilt is gorgeous! How very exciting forv BOTH of you and a wonderful opportunity for the rest of us! I am so glad you thought BIG, Stephanie...it shows off the fabric so nicely, and makes a more contemporary look, as well. Congratulations Melanie Testa and Stephanie Forsyth! And to enter me in this fabulous drawing and a chance to win these fabulous fabrics..well, I do so love the little chickadees. They crowd our half dozen bird feeders every winter and speak to my heart of the goodness of small things willing to work hard for survival..oh, I love the hummers, too, and the Great Blue Heron and the ...but I pick chickadees! i am in love with mellie's fabric line and do not know where I can buy it....it would be grand to win it! the fabrics are gorgeous! i love the red cardinals in wintertime! Colors that would cheer me up. Love the whole thing. My Fav little bird is probably the white-breasted nuthatch, which goes "beep beep!" instead of tweet tweet. Congratulations to you and MT on this achievement! The quilt and the fabric are marvelous, and remind me to feed my bird buddies every morning! I love all of them, but probably like the tufted titmice the best...congrats on being a cover girl! I love watching the goldfinches. Hummingbirds for sure! They are so fun to watch. I love woodpeckers....we have all sorts coming to the peanut and suet feeders! mumbird3(at)gmail(dot)com.......and with a last name like Bird - this is just the perfect collection!!! Red Cardinal. So strikingly beautiful! This really is an awesome prize! Yahooo! My favorite bird I see in my backyard, frontyard, anywhere is the cardinal. It happened to be my mom's favorite, too. Since she's been gone 5 years, each time I see one, I think of her and even hope that she's nearby. My favorite bird in our backyard are the pheasants. It's a weird name but the tufted titmouse- he is so cute!!! This is some of the most beautiful fabric I've ever seen! Thanks so much for the chance to win. I love the chickadees that visit our birdfeeder every day. I am a bird watcher so this is an impossible question to ask me. It is like asking which child do you love most. I have purple and yellow finches, red headed and bellied wood peckers, wrens of all kinds, bluebirds, mockingbirds, titmouses, cardinals, bluejays and that's just a few of who is here right now. In the summer I am surrounded by Humming birds and all sorts of beauty and as my Grandson says my 1000 friends. I live in a country setting and I love to watch the beautiful Cardinals flying around. I also like Humming birds and I have feeders out for them and watch them enjoy a sip or two. HI, oh it's my little Chicka-dee Friend! What a little bit of fluff+joy! What a gracious and beautiful giveaway too! Northern Mockingbird. I love listening to them! Usually just a few wrens. I would love to see cardinals. I forgot to tell you my favorite backyard bird so I deleted that comment and will try again. (Obviously reading instructions is not my strong suit! LOL!) Right now my favorite bird is a baby Horned Owl that showed up this fall. He is adorable! I have over 8 birdfeeders set up year round, so there is always a change in birds visiting during the season. I love the yellow warblers that come for grapes in the winter. They are so tame and will come right up to me. Then the clown in the yard is the nuthatch - zooming around. I love my hummers and goldfinch in the summer. Birds make me happy. Your quilt is gorgeous. When I saw the name, I went yep, she got that right. You captured the movement of the starlings swarming in and out so well. Thanks for the chance to win some of Melly's fabrics! I have feeders and a heated birdbath. I'm currently enjoying the nuthatch. I also had a chickadee feeding from my hand the other day. I don't know it's name but we have a pretty little bird that has a yellow chest, it's so cute, comes right up on the porch. Right now it would be a chickadee, but I love the Cardinal! My favorite is the Pilated Woodpecker. Love it for its strength and beauty. I honestly don't see that many birds in our yard... I DO see a lot of squirrels though! At this time of year it has to be the robin...the English version of course!! But the fabric reminds me of the kingfisher .... Thanks for the chance. Fabulous quilt! Love this line of fabric. My favorite common bird in my backyard is the Cardinal! My little dog Muffy and I used to be great bird watchers. Toward the end of her life, we saw an Arizona woodpecker feasting on something in our backyard jujubee tree, and much earlier in her life we used to have a neighborhood roadrunner which would dip in and out of everyone's backyard. I named it "special bird," and Muff always wanted to go to the window to watch him. Of course, we have year-round hummingbirds here in Phoenix, too! I like the cardinals but I think I like these fabrics a little more. I love watching chickadees. They are so polite. They take one sunflower seed out of the feeder and then fly to a tree branch to eat then. Then return to the feeder for another. I adore my year-round Anna's hummingbirds! I love birds in general but to see the Red Robbins in the front yard is a gift. They are such a beautiful bird and to wake up to their singing makes your day happy. Melanie's fabric are just beautiful. I followed her during the process and I feel so proud of her. And love how you used them in the quilt. Red Throated Hummingbird is a favorite. Great fabric, great quilting! I love Blue Jays. They're kind of bad tempered, but soo pretty! love the fabric. Right now we are trying to keep the hummingbird feeder from freezing. Little guys are fun to watch. Congrats on being in the magazine! It's hard to pick one favorite bird from my yard, I love them all. But I think I have to say the Cardinal, always so exciting to see that zip of red. Oh my gosh, this is so easy - my favorite bird in our back yard is a red bird (cardinal). I even made a red bird quilt I love them so much! Thank you for the giveaway opportunity - Happy Holidays! Beautiful fabric! My favorite backyard bird is the chickadee!! A pair nests in our birdhouse every year. It's fun to watch the parents during the spring take care of their chicks! They stay all winter and eat the sunflower seeds we put in the bird feeder. We have a lot of sparrows in the back yard, so I guess it would have to be them. Once, however, a huge raptor bird of some sort landed in the tree outside my living room window - caught it out of the corner of my eye. He flew off before The Google and I could identify him. Might have been a hawk of some sort. My favorite backyard bird is the pair of Anna's hummingbirds that have been here for about three years. In fact it's time now to go refill their feeder. 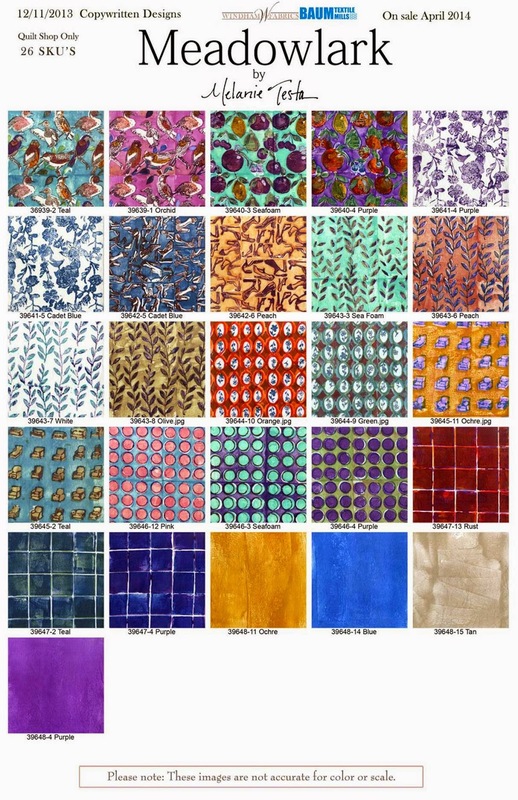 Then I'll go back to sewing for a while, and hoping to win these beautiful bird fabrics. Cardinals…..a quiet reminder of someone watching out for us that is now an angel! This quilt is gorgeous! And my absolute favorite bird is the cardinal. I love seeing the bright red against the harsh, white winters we experience here in upstate NY. It stops me in my tracks EVERY time. . .never gets old. I love the cardinals that stop by every morning to have breakfast with me. My cardinals remind me of al the people I love that have left my life but remain in my heart. I love watching the Hummingbirds in spring and summer. What happy fabric! I love the flash of blue as the bluebirds dart from tree to tree, or the ruby throated hummingbird as it zooms from feeder to feeder to butterfly bush, or the ~ ~ ~ I enjoy birds. Most all of them. and I would enjoy this fabric. Thank you for the opportunity. I just got this magazine the other night, and can't wait to get started on something! And I love the cardinals that stand out so well in the snow here in Massachusetts. Thanks! My favorite bird in the yard is cardinals, they look so regal! Hummingbirds are so interesting and friendly! I love the way cardinals stand out in the gray (or white) of winter. I can only pick one bird??? I really love them all. I like the Towhees, not visually exciting, but they are always busy in the yard and scamper when I go outside. Thanks for the opportunity! Living on the Chesapeake watershed/wetlands area of northeast PA brings many different birds through our yard. My favorite locals are a pair of cardinals, but even they migrate through. Robins nested in my big grapevine wreath, but they also migrate through. Woodpeckers of all kinds, but none stay. Ravens come and go. I asked my husband and we decided hawks are here all year and crows. There are tall trees all around. It's a privilege to live here. Plus I really love Melly's bird fabrics and wanted to say so. Cardinal and it was my high school mascot! I am not very versed in the names of birds. However, there is a really pretty yellow one with a tail longer than its torso. I have only seen it in the spring! Hummers. I love hummingbirds. If I hold still holding the feeder I can get 10 or 12 to feed. Some of them will land on me while they wait. There are quite a few hawks (I don't know exactly what kind) in the surrounding area. I love it when I see them soaring, or even sitting on the street lights. The quilt is gorgeous and the fabrics are wonderful. My favourite common bird is the robin. We also have a lot of humming birds but I don't know if they are qualified as common garden birds. Love the colors and the prints! My favorite backyard bird is the little tufted titmouse, because they're so cute and overlooked because of their soft gray coloring. Love this fabric line. My favorite backyard bird is the Lesser Goldfinch. Such a cheery yellow tiny bundle! I like a nuthatch -- they way they go down the side of a tree head first is very cool. My favorite backyard birds are the family of Mountain Chickadees that return to my yard year after year. Their little black heads and white cheeks are always a welcome site! I love the quilt and the colours. Favourite bird -a Christmassy Robin. I love the Cardinals and there is a pair that live nearby and comes to feed from the bird seed I throw out. I wonder do they know how beautiful they are.